A Swiss-Canadian company unveiled a proposal over the weekend to build a privately funded cable car system across Toronto’s Don Valley, connecting downtown with the urban greenery surrounding the Evergreen Brick Works, a former quarry and industrial site turned environmental community center. Steven Dale, CEO of Bullwheel International Cable Car, told the Globe and Mail that a gondola would solve the last mile transportation challenge of getting to the Brick Works, which the proposal refers to as an “undervalued” city asset. Evergreen Brick Works boasts a popular farmers market, a children’s garden and several event spaces, and is surrounded by parks and trails. But despite being a hub of eco-consciousness, the majority of the center’s 500,000 yearly visitors arrive by car, even though a shuttle and bus run there from downtown. Because the center is across one of the city’s many famous ravines, the terrain is too challenging for many to walk or bike. Dale says this project isn’t about public transit, though; it’s a recreation amenity and a civic landmark — and the entire thing would be privately owned, financed and operated. Dale estimates capital costs of $20 million to $25 million. He envisions a round-trip fare of about $10, with discounts for locals and annual pass holders. 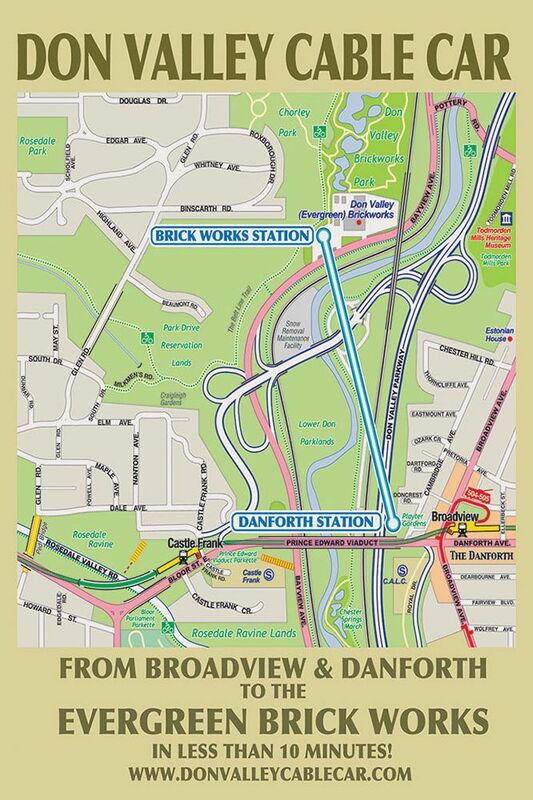 Forty-two cars would run on the line, supported by six towers built on city-owned land in the Don Valley, with the Brick Works station at one end and a station at Playter Gardens on the other. Cars would depart approximately every 30 seconds during rush hour, and more slowly the rest of the time for a more scenic experience. Each car would be equipped with bike racks and be fully accessible for those with mobility challenges. Dale estimates it could attract between 500 and 1,000 riders a day, and between 220,000 and 515,000 a year. No permit applications have yet been filed with the city. The Don Valley Cable Car project will host a community information session on March 8, near the proposed station location at Broadway and Danforth. Public response after the announcement yielded excitement, but also satire and doubt; similar ideas have been floated before, with nothing to show for it.